This mosaic is filled with things that I did this weekend! 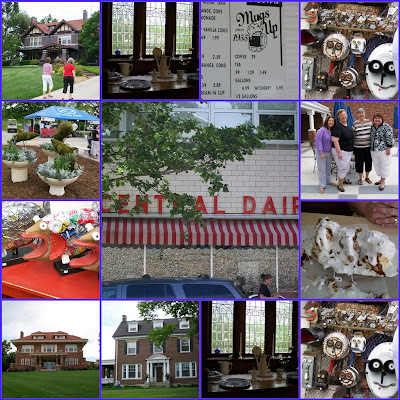 Friday night started with dinner and drinks with my STARR teacher friends, then on Saturday we went to the Columbia Art Fest with lunch at Mugs Up, Ashley and Bob's favorite summer hangout, we did a trip to Central Dairy for the world's best banana split, then on Sunday we did a historical home tour with friends! Fun, fun, fun!! Looks like yours was much more eventful/productive than mine! Terri, you mentioned two events, I just knew you would attend. The home tour and the art fest. Since we needed to be home for Xanti's testing, we were unable to go to either. My friend JoAnn was at the art fest. I also would have loved the home tour, in JC! Terri, I am impressed girl....this is wonderful!! I love historical home tours. It looks like there are some gorgeous houses there, too. You guys always have so much fun! Unlike some of us who stay home all day making applesauce - ha! Banana splits and looking at beautiful homes. How could you go wrong?